This recipe for ham done up in the slow cooker is an easy yet unique way of cooking your ham. Perfect for Easter, Christmas, Thanksgiving… or any time really! This is a sweet ham recipe that allows the meat to cook slowly in a flavorful apple cider liquid that is spiced nicely with cinnamon, nutmeg and even a little vanilla extract. Not your normal ham recipe, but one worth giving a try! As for the ham you select we like a nice bone-in ham as the bone adds additional flavor and moistness. 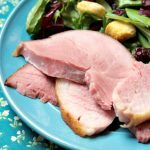 Don’t get a smoked ham (also known as a Country Ham…popular in the south) though as the flavor is overpowering in this particular recipe. 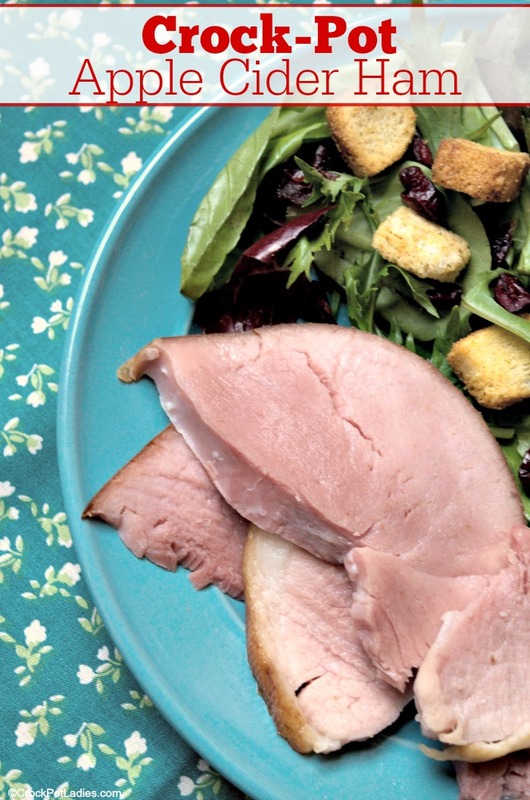 Pick a nice ham that will fit in your slow cooker. 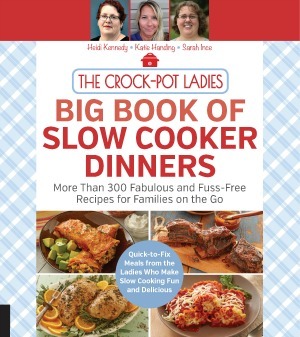 We recommend a nice big 6 quart oval slow cooker as that will hold most larger hams. 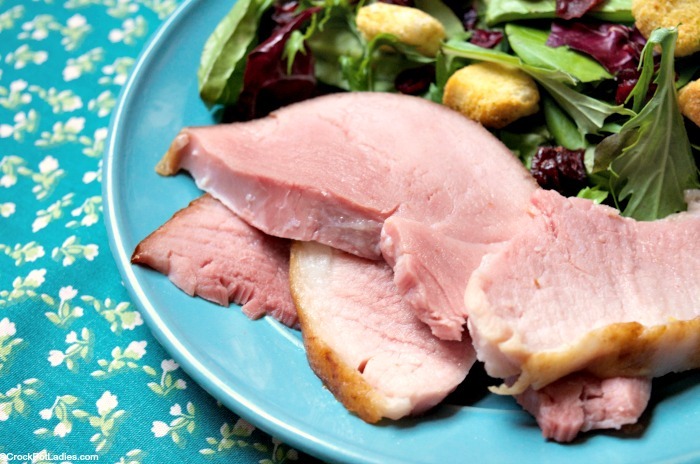 .This delicious slow cooked ham is perfect for any special occasion dinner! Place ham into a 6 quart or larger oval slow cooker. In liquid measuring cup mix together 2 cups of apple cider and ground cinnamon, nutmeg, ginger and vanilla and mix well. Pour over ham, saving measuring cup for more apple cider to come. Place cut up orange quarters in slow cooker on sides of ham. Press the brown sugar with your hands onto the top of the ham. If the ham is pre-sliced you can pack some of it into the slices as well. Carefully pour approximately 1 cup of maple syrup over the brown sugar, trying carefully to not lose the brown sugar into the apple cider. Cover and cook on LOW for 5 - 6 hours or on HIGH for about 3 hours or until the ham is heated throughout. Use tongs to carefully remove the ham from the slow cooker and place on a a serving platter. Baste the ham with the juices from the slow cooker once removed to keep the ham nice and moist. The amount of servings will really depend on the size of ham, I left that open as it really doesn't matter what size you get as long as it fits your crock. I only used about a half gallon of cider, it ended up being more cost effect to purchase the whole gallon, and I got a better quality brand that way. So glad your family enjoyed this ham for Christmas Kirk!